A tad minimalist maybe, but a mighty little powerhouse nonetheless - it's simply the broad range of sounds that win through here. Super-punchy delivery for size. Excellent built-in chorus. No antifeedback function. Few rear-panel connectors. The Loudbox Mini may be small, but it packs a punch for its size. The Loudbox Mini is minimal all-round; small, light and housing only simple features. The Mini's brown and cream colour scheme sets it apart from other Loudboxes. There's still a market for what we might call heavyweight acoustic backline, and SWR's California Blonde and Hartke's AC150 are two examples. But the overwhelming trend in recent years, exemplified by the likes of AER, Roland and the original Trace Acoustic combos, has been for compact amps offering much easier portability yet often packing very healthy power ratings and versatile facilities. The ultimate so far in the power-to-size race is ZT's Acoustic Lunchbox, dishing out 130W RMS from, well, a very small box. 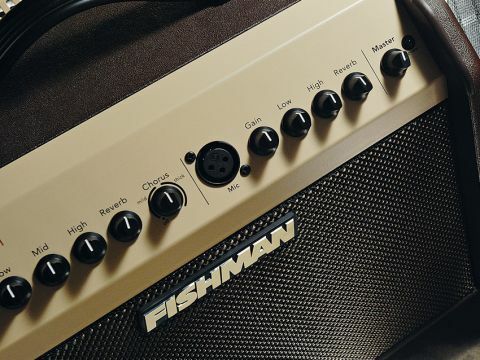 The latest contender to hit the shops is Fishman's 60W Loudbox Mini. As its name suggests, compactness is the Mini's prime physical feature. "While a mere 60 watts might not rank highly on the grand scale of things, the Mini fair chucks it out, even with a passive pickup system." The livery may be brown and cream, not the usual all-black Loudbox demeanour, but the twin-channel Mini retains a family resemblance - particularly to the Loudbox 100 - with a cabinet of not dissimilar proportions that sits gently raked back. Inside is a 6.5-inch speaker and one-inch tweeter; externally, everything feels sturdy and well bolted together though, as on the Vox, there are no corner protectors so this isn't an amp to carelessly fling around. Aside from its small size and low weight (under 9kg), the combo's emphasis is on operational simplicity. The instrument channel provides three-band EQ, phase reverse and (digital) reverb level, plus a two-mode digital chorus where the centre-detented rotary from off to halfway is a mild effect, then thick from there to maximum. The mic channel, with single XLR input, has two-band EQ and reverb level. There's no phantom power facility, so the channel is intended for dynamic rather than condenser mics. Neither channel has a high/low gain switch: you simply set the gain level according to whether your instrument system is active or passive. The master section is simply that: a master volume, adjacent to which is the power LED. Rear-panel connectors are pretty sparse: a mix DI out, which sends post-EQ signals from both channels, and an aux in for mp3 or CD player, which handily provides both 6.4mm and 3.2mm sockets. While a mere 60 watts might not rank highly in the grand scale of things, the Mini fair chucks it out. Even with a passive system we're talking adequate performance levels, and linked to an active instrument set-up the achievable volume is unequivocally loud - not just for the amp's physical size, but by any reasonable acoustic backline yardstick. One downside of this abundance of decibels is a tendency to feed back at high volume, especially when playing a dreadnought or jumbo, and it's a shame some kind of notching or auto antifeedback couldn't have been included. Of course, if your guitar's preamp incorporates a notch filter, then that's much less likely to be a problem. The amp doesn't sacrifice tonal quality for beef. The timbre is clean, precise and quite hi-fi like, each of the EQ bands providing a smoothly graduated, non-extreme range. Since the tweeter is always in circuit and non-adjustable, the highs can sound over-sparkling if pushed, but that's simply a matter of tailoring the treble band to taste. The quality of the hall-type reverb is very good, and the way the chorus is configured is excellent. Within the mild range the modulation is discreet - great for adding a touch of shimmer for general playing - while the more swirly thick end of the spectrum remains clean and mush-free even at maximum. It's a commendable halfway house between a preset and fully editable effect. The considerable attractions of the Loudbox Mini, size apart, are its plug-in-and-play simplicity, high-grade chorus and sheer power per watt, only compromised in practical terms by the absence of any feedback-busting facility.